Apprehensive Films will have booth's at both ZombiFest on September 21st and Miss Misery's Days of Terror on September 28th & 29th. 50% of all merchandise sold at our booth during both events will go towards our new film "And The Blood Drains Down"! ZombiFest is also a fundraiser for the 6th Annual Sacramento Horror Film Festival. 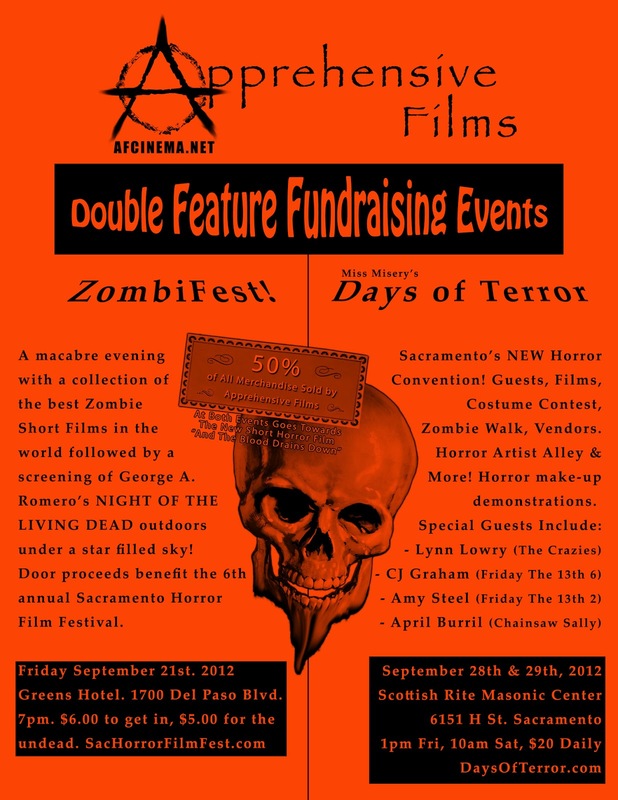 Checkout www.SacHorrorFilmFest.com for more info. Miss Misery's Days of Terror is the premiere Northern California Horror Convention. Some of this years guests include Lynn Lowry, April Burril, CJ Graham and more! Checkout www.DaysofTerror.com for more info. All Night Halloween Party is Number 1! !